San Francisco (Obama.net)- The United States government has already approved the new nuclear weapons treaty between America and Russia. Wednesday, the United States Senate passed the Strategic Arms Reduction Treaty by a final vote of 71 to 26. 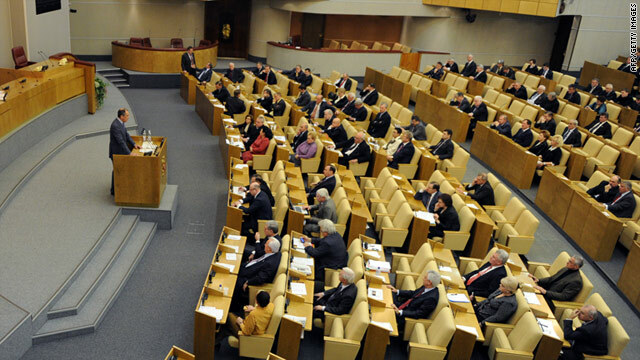 Friday, the Russian parliaments lower house passed the treaty as well. The final vote by the State Duma, as the lower house is known, was 350 to 58. In January, the Russian parliament will go over the treaty for a second time. After that, another review of the treaty will be made, and then the treaty will go before the Federation Council, the Russian parliament’s upper house. The treaty is designed to reduce the number of nuclear weapons in both the United States and Russia, the two largest carriers of nuclear weapons in the world by far. In addition, the treaty is also part of improving relations between the United States and Russia and turning the two countries that were once enemies in the Cold War into modern day allies. The agreement permits both states to evaluate the nuclear weapons of the other and make sure that neither side has more weapons than agreed upon. The treaty allows each state to only maintain seven hundred launchers and 1,550 warheads at any given moment. President Obama said that the treaty will allow the United States and Russia to lead the world in accomplishing the goal of riding the planet of nuclear weapons and making the world a safer place for all humans. The new treaty marks an important achievement for President Obama in his foreign policy goals. While the treaty has only recently been agreed to and is still at least a few months away from being implemented, the safety of the world and both the United States and Russia have increased as a result.